Pollack and Sons Specialty Nursery is in the midst of liquidating its stock in order to go out of business. All inventory is 50 percent off. The sale will be held Mondays through Saturdays 10 a.m. to 5 p.m. while supplies last. Visit them online or just go by the six-acre nursery at 7901 N.E. 179th St. in Battle Ground. Sad, but amazing for fall planting. The 3/50 Project, launched a year ago by a Minneapolis retail consultant and former shopkeeper, has inspired thousands of businesses across the country to educate their customers on the importance of shopping locally. The reason it worked? It gives customers specific instructions and retailers simple tools. Donna Jensen popped 3/50 Project flyers into her customers’ bags whenever they bought something at her Washougal yarn shop, It’s a Crewel World Yarn and Stitchery Shop. She printed up the flyer offered at www.the350project.net. It explains the simple concept: choose three independently owned brick-and-mortar businesses and spend $50 at them each month. Donna, who sold her business after 24 years to Washougal resident and longtime customer Jennifer Powell in April, felt it was her job to educate her customers about how crucial it is to shop locally. Donna said her customers would come in and show her yarn they bought on the Internet, or look at her yarn and then go find a better deal online. Jennifer is going to support local spending in new ways when she takes over the business. She will feature yarn from Clark County alpaca and sheep, and she plans to connect those learning to knit with local designers who can help them bring their visions to life for a small fee. 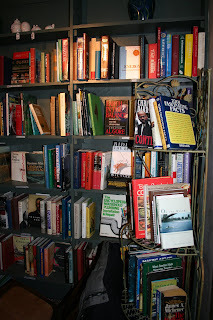 Becky Milner has owned a “bricks-and-mortar” business in Vancouver for 35 years, Vintage Books. She learned about The 3/50 Project from one of the booksellers associations she belongs to. She keeps the 3/50 poster in her window and makes a point of thanking customers for shopping in the store, tailoring merchandise to regulars’ taste and frequenting other independent businesses. But Becky’s business depends on the sales that the store does online, theoretically taking money out of the communities that those online customers live in. Very early in the store’s life, when its focus was automotive manuals and classic car ephemera, Becky offered a mail order catalog. The store started selling online in 1994 and today is considering social media. Without the online traffic, her business may not exist at all. Wendy Kosloski’s Longview business, Teague’s Interiors, is also a supporter of The 3/50 Project. (Businesses can be listed on the project’s website as “supporters.”) The fact that materials are available make it easy, and she said “it’s nice to see a larger group of people” pushing consumers to shop in their own towns and neighborhoods. Wendy said the fact that 2009 ended with seven new businesses in downtown Longview is “a sign of the upturn,” but that the downturn may have actually helped some independent businesses stay afloat. “There are things about the recession, like tightening your belt and watching gas, that helped us,” she said. 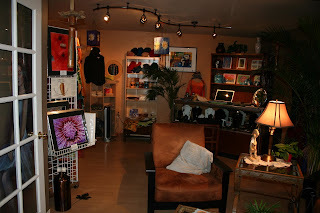 Wendy also believes that online shopping has hurt physical shops, but her store is somewhat protected because it is “custom decorating with a galley and boutique,” and her services must be done in person. Wendy is going far beyond flyers and posters to support local businesses, especially those with a creative angle. The upper floor of her building, the historic Title Building, is now the Working Art Center. Seven connected commercial spaces with access to shared common areas are for lease at $300 a month. They are being marketed to studio artists and small businesses. In the Commerce Building next door, seven studio apartments are for rent, creating a charming and historic live-work environment unique in Longview. As Wendy sees it, “independent businesses offer knowledge and service close to home and out of the ordinary.” And she, like her indie counterparts in Southwest Washington, continue to educate their customers and support each other. Salmon Creek Farmers Market is looking for you! 05.16.2010 The newly formed Salmon Creek Farmers Market will locate behind the Three Creeks Library next to the Fred Meyer on 139th St. The market plans to open July 15 and run through Sept. 30 every Thursday from 3:30 to 7:30 p.m. Currently the group is looking for farmers, producers, artisans and entertainers. There is also an immediate need for volunteers for planning and sponsorship. For more information on becoming a vendor, visit www.managemymarket.com. For information on volunteering, send an email to info@salmoncreekfarmersmarket.com or call Ann Foster at 360-574-5093. More awesome veggie opps — woo! Get your plot at 78th St.
Folks who want to plant and tend a garden at Clark County’s 78th Street/WSU property can submit their names to a lottery which will determine gardeners for dozens of available plots. To enter the lottery, submit contact information to Sunrise O’Mahoney at 360-397-2370 or sunrise.omahoney@clark.wa.gov between Feb. 20 and March 5 at 5 p.m. The drawing will be held March 8. Winners will be notified by March 11. People whose names are drawn will be given a 20-foot by 20-foot plot. Cost is $40, although some scholarships are available. No pesticides or herbicides may be used. The garden plots will be available from April to October. One plot per person or household. ADA-accessible plots are available. For more information, go to www.clark.wa.gov/78wsu and click on “Projects and Workshops” on the left. The public is invited to a community forum to hear about the changes in the Vancouver-Clark Parks and Recreation Department Community Garden Program, and discuss local food garden options. The forum is scheduled for 7 p.m. Jan. 12, at Luepke Center Community Room, 1009 E. McLoughlin Blvd. Parks and Rec reps will present some upcoming changes to the community garden program as well as discuss a new option: food gardens in neighborhood parks. When the department participated in a multi-agency public forum in April 2009, along with Clark County Health Department, some critical needs were identified around creating more food garden options, including more garden space and better access to education about gardening. To discuss these issues, the forum’s speakers include staff from the new Clark County Public Health Growing Groceries Mentor Program as well as the citizens who started the Rose Village Community Garden. More information about the Vancouver-Clark Parks and Recreation Department community and food garden program is available online. Click on Community Gardens under Facilities & Locations. 7.13.09 Oh, this sounds so great. Clark County is hosting a local food film festival (click for all the details) at Washington State University Vancouver on Friday, July 17, and at the County Public Service Building on Saturday, July 18. The films Good Food and Growing Awareness will be shown along with a sneak preview of Ingredients. The event is sponsored by the Clark County Food System Council. The Clark County Food System Council, a citizen advisory council whose mission is to increase and preserve access to safe, local and healthy food for Clark County residents, currently has membership openings. Council members share common interests and beliefs related to creating and maintaining a sustainable community food system. Members represent public health, nutrition and education, food security, waste management, resource conservation, agriculture, food distribution and community leaders. The council meets monthly on the fourth Thursday of each month from 4 p.m. to 6 p.m. at the CASEE Center, 11104 N.E. 149th St. in Brush Prairie. Applications will be accepted through April 15. For more information and to receive an application, please contact Tricia Mortell at 360-397-8000 ext. 7211 or email tricia.mortell@clark.wa.gov. Next Thursday, Feb. 5, check out “Green Working and Living: Local Actions, Global Perspectives,” presented by the Clark County planning Commission. It’s in conjunction with the National Teach-in on Global Warming from 4 p.m. to 6 p.m. at Clark College, Gaiser Hall, 1933 Fort Vancouver Way in Vancouver. A panel will talk about ways that Clark County is already green, and tips for businesses and homeowners. Panelists include Nicholas Phillips, city of Vancouver urban planner; Timothy Buckley, founder of Greenstone Architecture; Jill Sughrue, co-founder of the Lower Columbia Alliance for Living Sustainably; and Gary Bock, Vancouver Watersheds Council project manager. Sounds power packed to me, don’t miss it. If you are like me, you are checking more books out of the library these days rather than buying them. And, if you are like a lot of folks right now, you are using the library’s resources to help look for employment or find funding to pursue more schooling. Free watershed stewardship training is being made available this spring through the WSU Clark County Extension in partnership with the Clark County Clean Water Program. Starting Feb. 10 and running Tuesdays from 6:30 p.m. to 9 p.m. through April 14, volunteers can learn how to maintain healthy watersheds. To apply or for more information, contact jenifer.naas@clark.wa.gov 360-397-6060 x 7703 or apply online. The training uses community experts and environmental professionals to teach the basics of ecology, hydrology, geology, stream restoration, and the importance of native plants and fish. After training, volunteers work on a variety of projects with the Watershed Steward Program and local environmental partners in public outreach and education, stream restoration, water-quality monitoring, classroom presentations, or community workshops. What have you done for your environment lately? Ever heard of Agave Jeans? Ever touched one of their last-forever cotton pullovers? Trust me, they’re a big deal. Agave Jeans Co. is getting settled in its newly built Ridgefield headquarters, and the building is just about as hip as the apparel. Lucky for us locals, Agave President Jeff Shafer is planning to open a wholesale retail outlet inside the headquarters. That’s right– wholesale-priced designer clothes for sale in the same space where they’re designed. Pretty rockin’, if you ask me. What’s even more rockin’ is the party Agave is planning to debut the retail space. Shafer is planning it for sometime this spring, and he wants it to be big, with multiple live music acts and players from the fashion industry mingling with local Agave fans. Coming from a guy who sells fancy pants around the world and plays dance music in his custom-designed office, Agave’s debut is sure to please. Watch this blog for coming details. On my first day with North Bank and the Vancouver Business Journal, my editor took me on a tour of Clark County businesses. 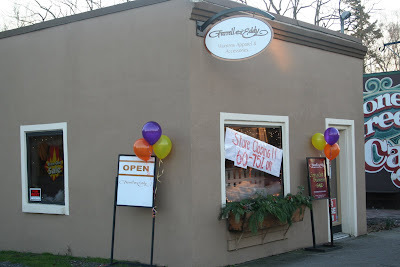 One of the first we visited was Farrell and Eddy, an upscale women’s boutique in Ridgefield’s small but lovely Old Town area. That visit to Farrell and Eddy told me that Ridgefield was a small town on the move. It was one of a handful of sparse but impressive retail spots. It had a price range that drew shoppers with money to spend. It was classy and cute. It seemed good for the growing town. Talk about signs of the time. It’s a little bit heartbreaking. After nearly two years in business, the shop is liquidating, and locals say the economy is to blame. It’s a great time for bargains, ladies, but an even better time to remember that local businesses need our support. We’re all stretching our dollars. But if we keep them local, they will do us a lot more good. Year-old Battle Ground artists’ co-op, Cupola Gallery, will host a grand opening ribbon cutting at its new space Wednesday, Jan. 21 at 4 p.m. Cupola celebrated its birthday by signing a lease at 510 E. Main Street in Old Town. Holy moly, it’s been a while. Well, I’m turning a new leaf. You are going to hear from me every single day that I am near a computer. There, I said it. The third annual annual Meet the Farmers event is coming up on January 21. Local CSA (Community Supported Agriculture) farms are up to a whopping 18 in the Clark County area, and these events are a way for potential customers to find the farm that’s right for them. The Vancouver Food Co-op and WSUV are sponsoring this one, and there will be a speaker from the WSUV Small Farms Team. It is from 7 to 8:30 p.m at the WSUV Firstenburg Student Commons, 14204 N.E. Salmon Creek Ave. in Vancouver. Another is coming up on Feb. 11 at Clark Public Utilities in DT Vancouver, sponsored by the Sierra Club. Personally, I belong to Purple Rain Vineyard in Hockinson and it is exquisite. Fresh Earth Gardens and WSU Extension Service are presenting a ten-week series of classes called Modern Organic Farming on Small Acreage. The classes include all aspects of starting and maintaining a small farm, including choosing acreage and crops, building soil, curtailing bugs and pests and bringing goods to market. The classes are Saturdays 10 a.m. to 2 p.m. on the WSU 78th St. Farm from Jan. 17 to March 21 for $450 or $50 a week. Class size is limited, so look into it now. Last month we admonished you to Go To Marcell’s. In case you haven’t been convinced yet, below are some shots of its lovely, lovely insides. Marcell’s opened in October at 3100 Columbia St. in Vancouver and offers coffee, sandwiches, pastries from local bakers, a book exchange and natural and locally made clothing, art and gifts. A performance space is in the works too. So, seriously, what are you waiting for? Go to Marcell’s! Good clean fun, I tell you. It’s what I love. Check out this great Summer Solstice event. On Saturday, June 21, from 10 a.m. to 3 p.m., three farms between Battle Ground and Vancouver will be celebrating the season with the public: Garden Delights, Half Moon Farms and Scented Acres. Scented Acres (13804 N.E. 117th Ave., Vancouver, 360-921-9737) with their lavender plants and products will have lavender lemonade, cookies and samples, as well as herbs and gifts for sale. Goats, baby chicks and full grown chickens are scheduled to wander through beautiful display gardens. A favorite of mine, Sweet Nectar Nursery specializing in hummingbird and butterfly attracting plants, will be there, along with Las Flores del Altipano Alpacas. Half Moon Farm (14737 N.E. 159th St., Brush Prairie, 360-514-9223) will have honey and samples, fresh flower bouquets and flower gardens to walk through. A chicken tractor showcasing how people can have chickens in their backyards will be set up. Pick up art from the farm and Volcano Garden Art. Garden Delights (15417 N.E. Parkinen Road, Brush Prairie, 360-892-4479) will showcase herbal pet products and treats, culinary herb blends and herbal gifts. Tours of the aerated compost system on the farm will be provided at 10:30, noon and 1:30. Chef Anna Petruolo of A Dinner Together will give out fresh samples of beef and veggies from the farm from 11 to 1.